San Francisco Bay Area composer, Brent Heisinger (1937), was born and raised in Stockton, California, began piano study at five and trombone lessons at seven. He and his physician brother Dale received musical training from their father, an exceptional band director, and both were highly influenced by their mother, a patron of literary and musical arts. At the age of 16, he studied piano at the Music Conservatory of College of the Pacific where his father was Director of Bands. After his schooling in the Stockton public schools where he played trombone in bands and orchestras, he attended Stockton Junior College (now San Joaquin Delta College) and transferred to San José State University where he received his Bachelor of Arts and Master of Arts degrees. As an undergraduate, he continued his piano and trombone studies, formed a quartet to play for dances, and arranged for the marching band. He began serious composition studies with Frank Erickson and Stanley Hollingsworth during his graduate years there. After teaching music in elementary and secondary schools for four years, he completed his Doctor of Musical Arts degree at Stanford University where he studied composition with Leland Smith and Humphrey Searle. He joined the music faculty at San José State University and during his tenure conducted choral and wind ensembles, taught trombone, piano, conducting and composition, and served as Theory/Musicianship Area Coordinator. Heisinger also was active as a clinician, speaker, and consultant for the Contemporary Music Project (funded by the Ford Foundation and the Music Educators National Conference), which promoted the idea of comprehensive musicianship; he authored several articles and three textbooks on the topic. Among his most significant writings are the articles “American Minimalism in the 80s” published in The Journal of American Music and “Compositional Devices in Steve Reich’s Octet” which appeared in Ex Tempore. 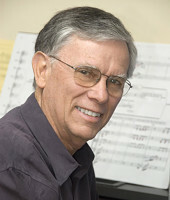 While at San José State University, he was presented the School of Humanities and Arts Certificate of Distinction, selected as a Teacher Scholar, named Outstanding San José State University Music Alumnus, nominated for the Carnegie Foundation United States Outstanding Professor Award, and awarded the distinguished President’s Scholar Award. Influenced by the likes of Stravinsky, Bartók, Gershwin, Lou Harrison, Steve Reich, and great jazz performers, Heisinger says about his music, “My works bounce from one palette to another. I have no desire to own a style.” This is evidenced in the diversity of his music much of which has been published and performed throughout the world. Nubes Aztecas (Invocación y Canto) commissioned by The Choral Project of San José, received performances in Mexico and Costa Rica, Essay for Band and March for Timpani and Brass are popular in western Europe, Eklektikos— In Five Pieces, has seen performances throughout the U.S., and by French pianist Voya Toncitch in Israel, Finland, Taiwan, Brazil, Singapore, Manila, and India. Also, A Walk Within Winter (composed for pianist Donna Stoering) has been heard in Russia, Finland, Switzerland, Poland, England, Brazil, and Germany. Heisinger’s Concerto No.2 for Piano and Wind Ensemble has received two first prize awards and 2nd prize at the 5th International Composition Competition (“Coups de Vent”) in Le Havre, France. Both the United States Air Force and Navy Bands have performed his symphonic band music. In a new direction involving considerable improvisation, Ekta (“oneness”), commissioned by the San José Chamber Orchestra and scored for solo piano, jazz rhythm section, tabla, string orchestra with two percussionists, was premiered in 2005. The unusual integration of an Indian raga and tals, American jazz in a “classical” setting, was enthusiastically received. Soulscape, his most recent work, (2010) was commissioned and premiered by The Ohlone Wind Orchestra of California. As Emeritus Professor of Music, Brent Heisinger is active composing and supporting the San José State University School of Music and Dance and oversees his own HBH Publishing. He and his wife Barbara reside in San José and enjoy the families of their three sons Dean, Doug, and Kurt. The Fellowship was very special, allowing me to fund my immediate musical project(s). I am now an Emeritus Professor of Music from San Jos? State University, finishing a third EKTA (oneness) concerto for San Jos? Chamber Orchestra, directed by Artist Laureate Barbara Day Turner, and featuring soloist American-African drummer royal hartigan. My current interest lies with musical ideas/practices of cultures other than mine. Yes that?s correct, royal hartigan does NOT use upper case in his name. Still in need of funds.